Recycling at home has become a good habit many Portland residents have gotten into. But there is a change with statewide recycling that could have serious implications. You might not know this but most of the mixed paper and plastics that are collected for recycling are actually shipped to China for processing. But now China has decided it is going stop accepting a long list of specific items. What does this mean for your recycling? You can and should keep it up but you might have to do even more pre-sorting. What happens to all of those items? They should be put into the regular trash for now until a system is put in place to handle those kinds of recyclables. That takes care of most kitchen trash but what about bigger items like furniture, clothing, appliances and e-waste? Can those be recycled? Actually, they can if you work with a company like Junk King Portland. Junk King has dedicated itself to keeping as much of what they collect out of local landfills. This doesn’t automatically mean everything gets recycled. Instead, a lot of what they collect that is still useable can be dropped off at charitable organizations. A lot of those groups hire folks to fix and refurbish those items. That means creating jobs and creating items for those in need. Bottom line: We all need to be careful about recycling. 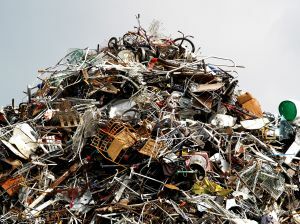 When it comes to recycling the big stuff, you can always count on Junk King Portland to get that job done. This entry was posted in Portland junk recycling and tagged junk King, Junk removal, recycling on November 30, 2017 by Junk King. Last updated December 3, 2017 .